The Ojai Valley Inn has five restaurants, each with a unique setting and sense of place. All of the restaurants feature exceptional service and California Central Coast cuisine made with the freshest local ingredients. 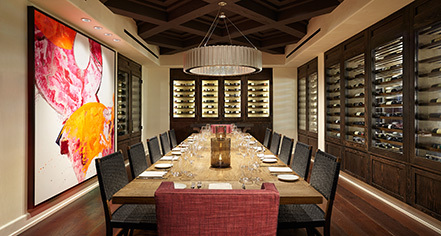 Ojai Valley Inn's signature restaurant, Olivella, is an unrivaled dining experience that showcases the culinary techniques of Executive Chef Andrea Rodella and features the best local ingredients and an award-winning wine list. The Oak offers daily breakfast, lunch, and dinner experience featuring locally sourced products, many from the hotel's own garden. Dine inside the fireplace or outside under the vine-covered pergola overlooking the golf course and sweeping mountain vistas. Jimmy's Pub is an authentic pub atmosphere with a award-winning cocktail program featuring an impressive selction of microbrew beers and wines from the Central California region. Spa Café offers guests wellness-inspired fare including fresh juices and smoothies, salads and grain bowls. Available in the cafe as well as poolside within the resort's Spa Village. Enjoy refreshing cocktails, fresh salads, and tapas while lounging poolside. 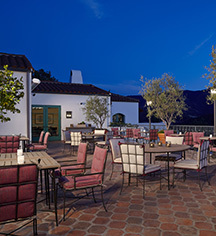 The Ojai Valley Inn also offers poolside meals and menus at Pixie Pool; cocktails, tapas, and small plates at Wallace Heritage Bar & Courtyard; quick-serve options at Libbey's Market; and in-room dining options.